Client conflicts and project problems are never expected or welcomed circumstances in freelancing. Who wants to deal with an unhappy client or project gone bad? If you’re like me, you want to avoid these situations like the Ebola virus. It’s unhealthy for you, as well as the people around you. Unfortunately we’re all going to be exposed to some of these problems in our freelancing journey, but the good news is that we can prevent a majority of them from happening. Scope of project: What is included with your project fee and what isn’t? List every detail out so there is no question about what you are providing and what you aren’t! This should always be your priority in any proposal you send out. Timeframes: Provide your client with milestones or dates for when they can expect your work to be done. Be realistic and don’t underestimate this. Remember it’s better to under-promise and over deliver than over promising and not delivering. Client Expectations: Clients expect you to do your work and deliver on time and on budget, but you should also set defined expectations for what your client needs to do as well. Let them know that if they don’t follow through with their expectations that it can delay the work or increase the cost of the project. Payment Schedule and Terms: If you want to be successful as a freelancer, you’re going to have to get great at asking for money and business terms that benefit your business. Conflicts can arise when you don’t let clients know when you want to be paid and how you provide your services. Be upfront on these items. Project Conflicts: It seems funny to add this to the list, but sometimes you need to include a process in your contracts when client conflict happens. Do you want to have a three step process for resolving disputes? Will you need to bring in legal counsel for instances you or the client threatens to sue. Thinking through and preparing for the bad circumstances is always beneficial should it happen to you. Providing detailed information to your clients regarding the project is always going to help you – and them – in the long run. 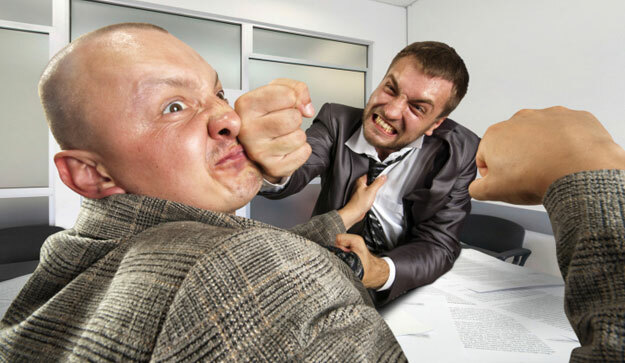 When it comes to conflicts, we typically have two responses — fight or flight. For some people, it’s easy to become extremely defensive and want to meet the conflict head on, but this will only make matters worse. Other people prefer to run and hide under a rock, hoping the troubles will pass by. This will also make matters worse. So what do you do? 1. Keep Calm and Chive On. Seriously. While those memes have been used ad nauseum, there really is no substitute for keeping calm in problematic situations. Take a deep breath and then wait to respond. 2. Assess the Problem. Look at the entire situation from every angle. Put yourself in your client’s shoes to see what they might be dealing with. Assess whether you’ve covered all your bases or if you’ve dropped the ball. Be honest and be fair. 3. Respond Professionally. Whatever the situation, it is always best to respond as professionally as possible. Don’t take any attacks personally and remember this is a business transaction. Be polite and be careful of what you say. You can easily turn a fiasco into a triumph by being professional. 4. Take a Clear and Committed Course of Action. It is now likely up to you to determine what happens next. Can you resolve the conflict and make the client happy? Will you need to fire the client and refund their money? Whatever your decision, you need to be upfront and clear with the client. You then need to follow through and not waiver. 5. Move On. Once you’ve made your decision, whatever that might be, you need to put it behind you and not dwell on it. This is solely for your benefit. There is one last but very important piece of advice that I want to share with you and that can make a tremendous difference between a happy ending or a horrible nightmare: Be honest! There have been numerous times in my freelancing career where I completely dropped the ball on a project. I’m nowhere near perfect. I make mistakes, and when I have, I’ve been completely honest with my clients. I made no excuses and only blamed myself. And you know what? Every client I was honest with forgave me and became even more committed to doing business with me because of my honesty. Sometimes all our clients want is real, honest answers. If you practice these tips, I promise you that client conflicts and project problems will be greatly minimized, but even if you do happen to get into a bad situation, you can be fully prepared to handle it like a professional freelancer should.